When you have a romantic day or weekend planned, a couples massage is a great activity to share, allowing your to relax and bringing you into the present moment, so you can enjoy your time together. 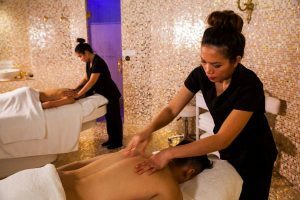 High quality couples day spas in Melbourne offer a range of styles of massage, from aromatherapy to deep tissue massage and hot stone massage that will leave you relaxed, tension-free and ready for fun and romance. A couples massage is a perfect opportunity to connect with your partner. Connecting does not always have to be about talking about things that are deep and meaningful. Psychologists have observed that sharing everyday activities builds connections between couples. And if you’ve never shared a couples massage, the novelty of a new activity will be fun. During a 50 or 60 minute couples massage, the focus is purely on the two of you – your comfort and relaxation. Sharing a couples massage allows you to talk and share with each other, while in a relaxed state. For couples who prefer not to talk during a massage, just sharing the intimacy of an hour of pleasure and relaxation, with soft music and the scent of aromatherapy oils, will allow worries to melt away and leave you feeling relaxed and more open to connection. The History Of Massage: Massage has a long history in many healing traditions. It is widely used in Chinese medicine, as well as in Japan and in India. Europe also has a tradition of massage and bathing (balneotherapy) for the treatment of many ailments. In western countries, massage is used therapeutically, and for relaxation and pleasure. Massage For Stress Reduction: Massage is known for its therapeutic benefits in reducing stress and anxiety and its promotion of relaxation. More and more research is identifying the underlying physiological processes that occur during massage that lead to relaxation, a sense of wellbeing and a decrease in pain. Research has identified an association with activation of the parasympathetic nervous system. This explains the calming, relaxing and healing effects of massage on the body. Pressure & Techniques: Massage therapy uses different techniques to palpate the body to enhance relaxation and bring about the release of muscle tension. These techniques include using pressure along the length of the muscle, across the muscle, using deep circular movements, and squeezing motions, as well as the well known gentle but firm karate chop! Whether you are suffering with a particular injury or you just want to relax and enjoy the pleasure of a full body massage, there is a style of massage and level of pressure to suit you and your partner. In a couples massage, you don’t need to have the same style. If you like deep tissue massage, but your partner prefers a relaxation massage with light pressure this should be easily accommodated by the Dayspa. It’s a good idea to discuss your preferences when you book your massage. This way the Dayspa can make sure the right massage therapist is available. There are many different styles of massage. Some are particular to a specific cultural tradition. Despite their differences, all massage is designed to release tension and relax the body by using different techniques and different levels of pressure. Some popular massage styles include deep tissue (or Swedish massage), hot stone massage, Lomi Lomi, relaxation massage, and aromatherapy massage. Deep Tissue: Deep tissue massage is similar to Swedish massage and uses, usually, firm pressure to release chronic muscle tension from tendons and fascia. Hot Stone: Smooth stones are heated and placed on important points on your body in a massage for deep muscle relaxation. Relaxation Massage: This type of massage involves using gentle pressure and smooth, gliding strokes to assist with relaxation. Aromatherapy Massage: Essential oils are used in a carrier oil to massage the body. The technique involves massaging along the length of the muscle. There are beneficial effects derived from the choice of essential oils, which are known for their calming, uplifting and energising effects. Lomi Lomi: An Hawaiian style of massage that uses long flowing movements and is beneficial for relaxation and improving circulation. If you are looking for a way to celebrate your romance, why not book a couples massage or couples dayspa treatment for your next romantic weekend or midweek escape. You may be surprised at the magical effects massage can bring. 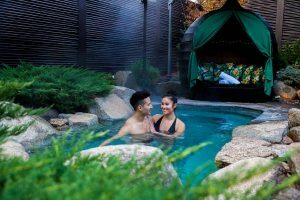 Enjoy a full day of relaxation and romance, with a couples massage, hot springs bathing and Yum Cha lunch, only 45 minutes from Melbourne at Japanese Mountain Retreat. This exclusive couples spa resort is set on 5 acres of lush gardens and is the only completely private outdoor hot mineral springs resort in Melbourne and Victoria. Romantic accommodation for one night or two nights is also available with a range of luxury couples spa packages. Japanese Mountain Retreat offers a luxury dayspa experience. A 50 minute massage is $160. A 50 minute couples massage is $320. We also offer an 80 minute massage or Hot Stone massage for $220 per person. Our most popular package is outdoor bathing and massage, which costs $230 per person. Our website details our complete range of outdoor bathing, indoor bathing, massage and spa packages. We’d love to help you plan the perfect couples dayspa experience. Please take a look at our packages online and if you would like to know more, give us a call on 9738 0086.